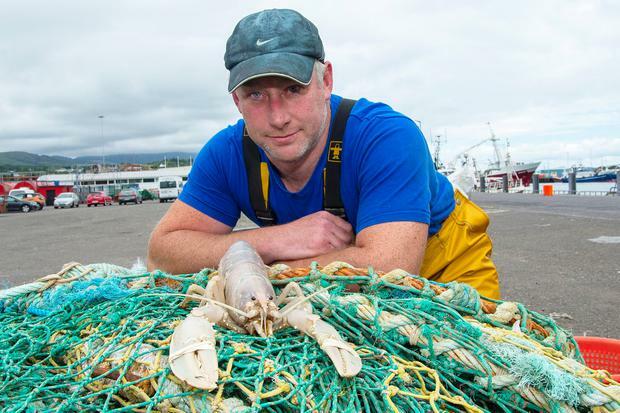 An Irish trawler skipper celebrated a one-in-100-million chance catch after landing an exceptionally rare white lobster. Donagh O'Connor, who fishes on the 'Fair Maiden' out of Castletownbere in west Cork, was astounded when he noticed something unusual as he checked lobster pots. Mr O'Connor was fishing in Bantry Bay on Friday. "I thought the lobster was white, but I couldn't believe what I was seeing," he said. Mr O'Connor had landed a female white lobster. Marine experts estimate that just one in every 100 million lobsters are born white. In fact, US marine experts believe that fishermen have a greater chance of being bitten by a shark than of landing a rare white lobster. Immediately realising the significance of his catch, Mr O'Connor made contact with Dingle Aquarium in Kerry and offered it the white lobster. Kevin Flannery of the aquarium was thrilled with the offer and will now keep the lobster for scientific study. Dingle now joins an elite group of marine institutes worldwide that have living lobsters with rare colourings due to genetic mutations. The white female is packed with thousands of eggs. Mr Flannery and his team hope to raise the baby lobsters to determine if they have a white pigment, just like their mother. Once the juvenile lobsters are strong enough, they will then be released back into the wild off the Kerry and Cork coasts. Fishermen pointed out that the small juvenile lobsters would have a much higher survival rate in Dingle Aquarium than in the wild, where many youngsters fall victim to a variety of predators. Scientists believe white lobsters are one of the rarest creatures in the seas. Lobsters get their colour by mixing a variety of protein pigments, ranging from yellow to blue and red. A cooked lobster always turns red. However, the majority of live lobsters are dark blue-green or brown-green, due to the mixing of pigments. A living red lobster is rare and estimated to be one in 20 to 30 million lobsters. A blue lobster is estimated to be one in two million. Then there is the split-coloured lobster, which is roughly half-orange and half-brown. Such a split colouring occurs in roughly one in 50 million lobsters with one such lobster caught in the US last year.